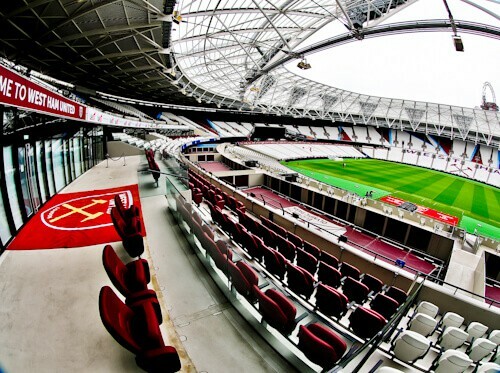 West Ham Stadium tours can be booked in advance online. 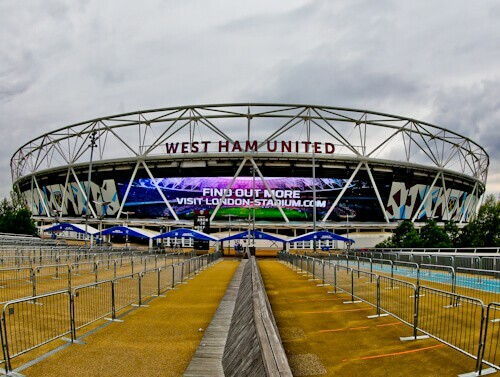 The London stadium is located in Queen Elizabeth Park, Stratford, East London. It’s very easy to get to, simply take the London Underground to Stratford station. There are 4 lines serving Stratford including Central, Jubilee, DLR as well as the London Overground. Once you arrive, follow signs to Queen Elizabeth Park. In addition to London Stadium there are several other buildings from the London Olympics including the tallest tunnel slide in the world. 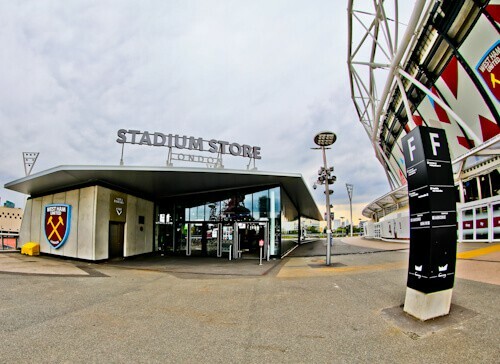 The West Ham stadium tour meeting point is at the stadium store. The stadium store is located at Gate F. Once inside the store take the escalator downstairs and the staff will inform you about the stadium tour. As well as the stadium tour meeting point, there are lots of West Ham as well as London Stadium memorabilia on sale. 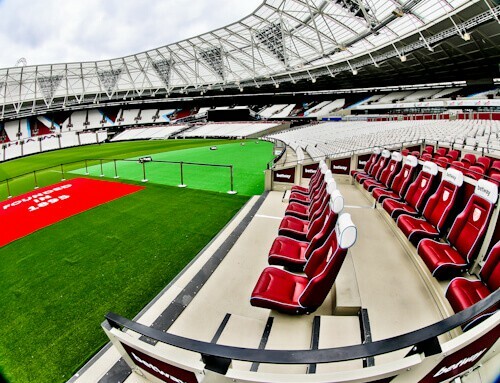 West Ham moved from Upton Park to the London Stadium in 2016. What happened to their former ground, Upton Park? Upton park was demolished and become housing. 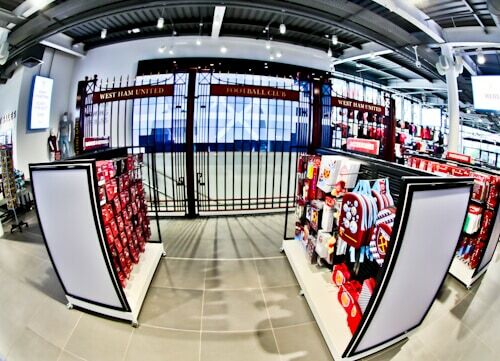 However, inside the club shop are the iconic John Lyall Gates. These are to West Ham what the Shankly Gates are to Liverpool. Furthermore, the stands behind each goal are now named, the Bobby Moore and Trevor Brooking Stands. The first stop on the London stadium tour is the Royal East Lounge. This very elegant lounge features several interesting wall features including a golden map of London. You’ll also see the iconic gold outline of the famous 1966 World Cup sculpture which features Bobby Moore, Geoff Hurst and Martin Peters. You may ask, what do West Ham have to do with the 1966 World Cup? These 3 players were in fact West Ham players, for this reason West Ham claim they have won the world cup! 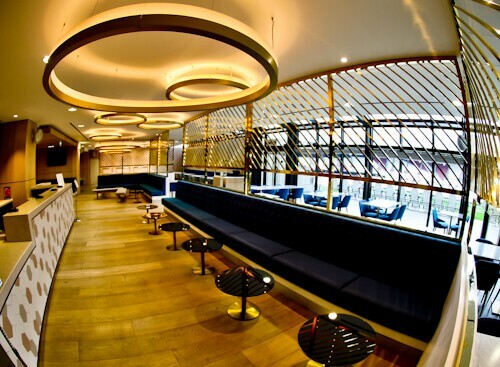 Be sure to look up when you visit the lounge as there are olympic rings on the roof. When you enter the stadium, of course you will enter in the area with the best view. Well, not quite, you’ll be in the area adjacent to the royal box. During the Olympics, this is where the Queen famously entered the stadium after arriving with James Bond. When you sit adjacent to the royal box, the guide will explain how the stadium works as well as which events it can host. Furthermore, you can watch a video on your interactive guide of the famous events which took place in the stadium. One of the most famous events was Super Saturday when Mo Farah, Greg Rutherford and Jennifer Ennis all won a gold medal here. The stadium capacity was 80,000 during the Olympics. 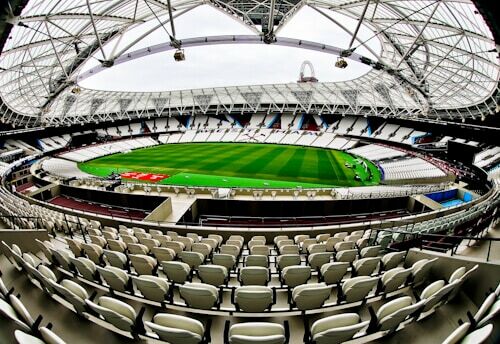 Today however, the stadium has been modified to be the home stadium of West Ham. As a result the capacity is now 66,000 with a maximum of 57,000 for football matches. Due to the large size of the pitch, during concerts the capacity is 80,000. Famous acts who have performed here include, The Rolling Stones, Robbie Williams as well as Beyonce. The stadium also hosts Athletics events and the running track still exists under the front seats. In fact, the lower tiers can be retracted to reveal the athletics track. The London multi purpose stadium is one of the most unique stadiums you’ll ever visit. You can visit the West Ham home team dressing room on the tour. As well as their changing rooms, you will see their color-coordinated showers and facilities. All guests on the West Ham stadium tour have an interactive guide in addition to the tour guide. 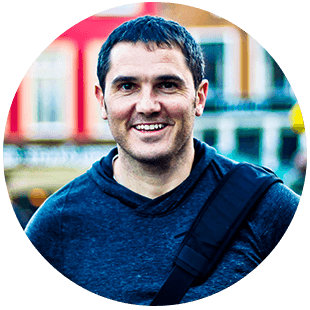 When you hover the interactive guide over a players shirt, a video of that player will be shown on the screen. You do not visit the away team dressing room as part of the West Ham stadium tour. 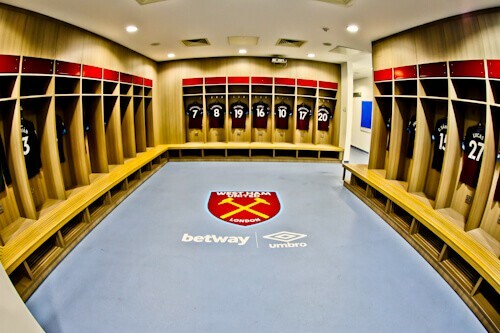 I was told that they are similar to the West Ham dressing rooms but without the logos. As this is a multi purpose stadium both dressing room facilities are equal. Not only were the Olympics held at the London Stadium but also the Athletics World Championships in 2017. In fact, the last time Usain Bolt competed in the 100 meters was at these championships. If you watched these championships you may remember the 60 meter indoor warm up track. 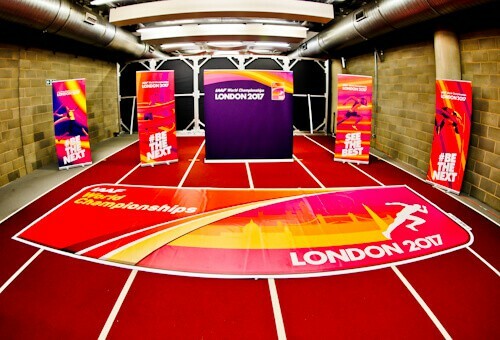 As part of the tour you can will visit the indoor warm up area. There’s even a set of starting blocks so you can do your Usain Bolt poses for pictures. 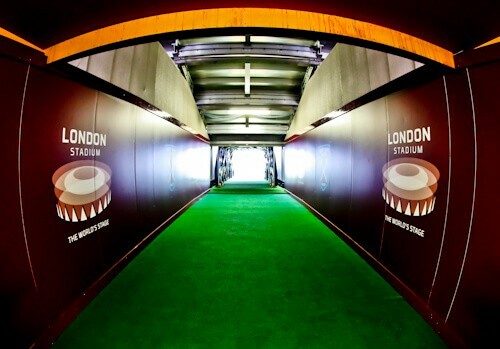 Every home game the West Ham players walk through the players tunnel. 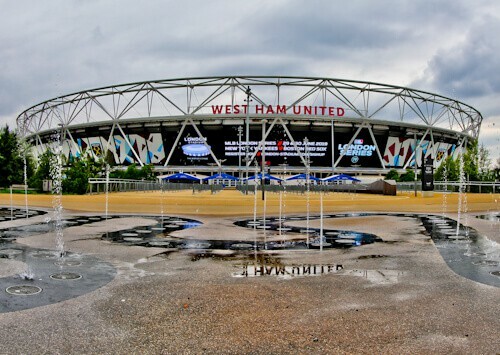 You will experience this famous walk as part of the West Ham stadium tour. Several famous players and managers have walked through this tunnel into the stadium. Famous West Ham players who have walked through here include Chicharito, Felipe Anderson, Jack Wilshere and Andy Carroll. Managers who have walked through this tunnel include Jose Mourinho, Arsene Wenger, Pep Guardiola and of course, Manuel Pellegrini. Normally when you take a stadium tour you must sit in the dugout to sit where the manager sits. Due to the fact the dugouts are quite a distance from the pitch, you must stand pitch side to imitate the managers. You can use the interactive guide here to give you a 360 degree video of how the atmosphere feels when the stadium is full. 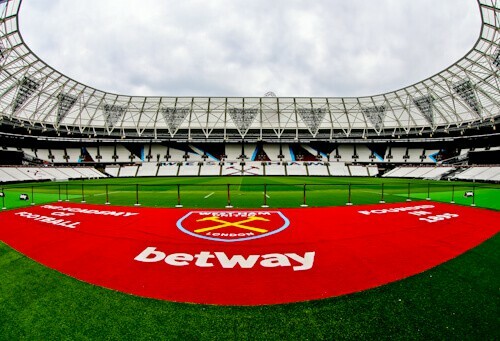 West Ham have played Premier League football since moving to the London Stadium. For this reason several famous players have sat on these benches. Famous players which have used these benches include Mo Salah, Harry Kane, Eden Hazard, Marcus Rashford as well as several other stars. You’re welcome to sit in this area and take as many photos as you wish. The flash interview room is a good place to make a little video as you come to the end of the tour! Here you can stand and give interviews as the players and managers do after the match. As a matter of fact there are several flash interview rooms so you can spend as long as you want in them. The easiest way to get to the stadium is on the London Underground. Both the Jubilee and Central lines stop at Stratford station (and the overground). Once at Stratford station follow signs to Queen Elizabeth Park. There’s also a huge shopping mall at Stratford station with some good places to eat as well as shop! 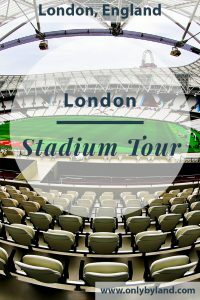 Enjoy your London / West Ham stadium tour and be sure to book online to reserve your place. 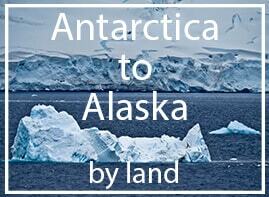 Check the Arsenal stadium tour, Twickenham stadium tour as well as the Millwall stadium tour.